Like many adoptees, Don Anderson from Portland wanted to know the roots of his identity. He started his quest in 1995 and found his birth mother in 2001, but it took him until 2015 to confirm the identity of his father using DNA research. 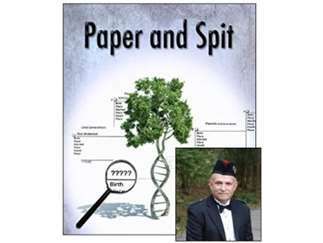 His book, “Paper and Spit,” chronicles his journey. It is filled with many ups and downs, and climatic, breakthrough moments. Hear Don tell his story on April 16 at the Genealogical Society’s free monthly meeting. Even if adoption is not your story, Don can inspire you to search for your own unique heritage. Come to Williamson Hall on Tuesday, April 16, enjoy a morning cup of coffee, and lively conversation about genealogy. Plus, learn how Don used DNA and genealogy together to find his birth parents. Don will have books available for purchase. If you already have a copy, he’ll be happy to sign it for you!